Whatever happened to $2 hay in the field? Alfalfa in my area is now $23 a bale and a sack of feed that cost $10 not so long ago is now closer to $20. Not to mention the price of fuel. With these numbers in mind I decided to start a horseman’s wealth section of my blog where horse owners can share steps they have taken to control their horse expenses. 1. Keep them healthy – there can be a temptation to buy less expensive feed or cut back on needed supplements but one vet bill can undo any short term savings. Since feed is a huge horse expense, I focus on making sure my horses get the most out of every bite they eat. I give this powdered blue green algae blend for probiotics, digestive enzymes and whole food vitamins and minerals. This is my basic insurance policy for health but my horses also get individual supplements to meet there needs based on Five Element feeding. 2. Avoid feed waste – My horses used to pick through their hay and waste large amounts of it. They knew I liked to keep hay in front of them at all times so they got really choosy. Now I feed more hay only when all the previous feeding has been consumed. If the ground is wet I put the hay in feeders or small hole hay nets to keep it from being stomped into the mud. I also have goats and find that the coarser hay the horses leave for last the goats will eat so I can add fresh hay in sooner. 3. Drive less – Fuel costs are ridiculous so I buy as much feed at one time that will keep fresh. I don’t want feed to get old but I can usually keep at least a months worth at a time. This takes more planning so I run out of everything at one time and don’t have to make multiple trips to the feed store. The same applies to hay and it may be worth building a bigger hay barn as hay is generally less expensive by the truckload. 4. Take in a boarder – Boarding horses for the public can be a huge undertaking but you might be able to find a friend who needs to board a horse. My friend needed a place to keep her horse for a few months last summer so I kept him short term. She did not want to pay full board at a show barn as she did not plan on riding him. I charged enough in board to cover my time and expenses and this helped me cover some of my feed costs. He got along great with my guys so it worked out well. 5. Lease your horse – I have a friend who wanted to ride but did not have a horse. He has been riding my mare, Cerise, and in return helping me with projects around the place. This has been a huge help as I would have had to hire someone to do the work. You might find someone willing to contribute to your horse’s upkeep in return for some riding time. 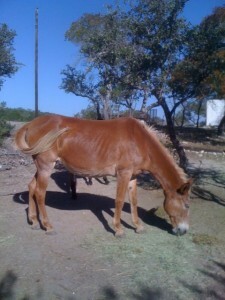 This entry was posted in Feeding Horses, General Horse Care, Horseman's Wealth and tagged horse expenses, horseman's wealth on March 13, 2012 by Madalyn Ward, DVM.